As I mentioned in yesterday’s entry, Mr. Karen and I spent last week at Walt Disney World. Last week plus a few days, actually, as we left on Friday the 6th around noon in order to participate in some of the WDW Today and Mouse Fan Travel Reunion events. Before we could leave, though, we had to pack, and I had to do my nails. 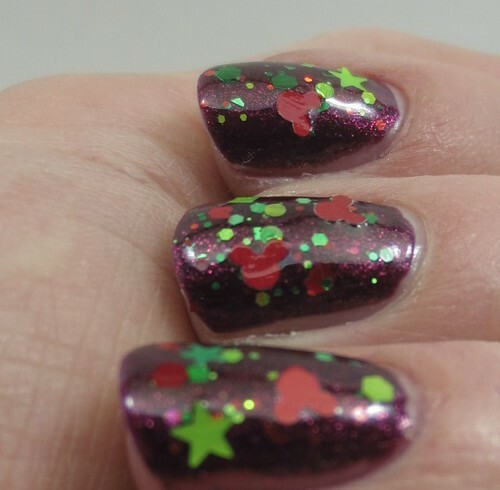 The nails were easy; I’d bought the perfect polish for WDW at Christmas time, with red and green glitter, including some in the iconic Mickey head shape. Over a wine shimmer, it was just the thing. Packing was harder, as the weather forecast ranged from highs in the upper 80s some days to lows in the 40s other days, so we’d need a lot of options and layers to accommodate those fluctuations, plus we had two fancy dinners scheduled, plus we need an assortment of park touring shoes to pamper our aging feet. I pulled out all the clothes I wanted to take, then pared down the piles and still had more than would fit in my big suitcase. Mr. Karen was having a similar problem, so we finally decided to just take a third bag and pay the fee. Thirty five dollars each way seemed a reasonable price to pay to ensure we’d be properly attired and comfortable and not have to take time out from fun to do laundry. Our flight down was crowded but otherwise fine. We’d booked a limo to take us and our luggage direct to our hotel instead of leaving it to the vagaries of Disney’s Magical Express, so before too long we were checked in at Disney’s Polynesian resort, wearing our MagicBands, and enjoying our first Dole Whip of the trip. We took a quick stroll around the resort to look at the construction before heading off to Hollywood Studios, where we had enough time to grab dinner and ride Tower of Terror before meeting up with the Reunion group for that night’s special event, a DE-sserts & DE-lights party after park closing that we were able to go to because we’d booked a package through Mouse Fan Travel. I expected we’d be eating desserts and getting to see the Osborne Lights, but the event started with a couple of surprises: our first stop was the most popular attraction in the park, where we got on with no wait at all, and our second was to meet Mickey Mouse dressed in his Dickensian Christmas finery, with cookies to nosh on while everyone took a turn getting their photos taken with the Mouse. 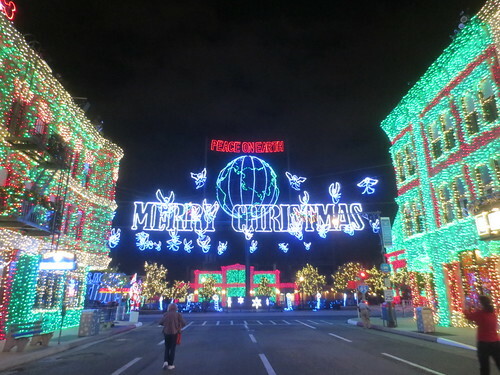 Then we did go back to the Osborne Lights, picking up a treasure chest of desserts on our way in. It was so great to see the lights switched on and then be able to wander the streets in any direction we chose without being mashed up in a big crowd. We hunted for Hidden Mickeys, and Mr. Karen spotted the purple cat (he thought I’d spotted it first but I was pointing at nearby Hidden Mickey), and we stayed until the very end, when the music stopped and the last stragglers headed out to the buses (which was also a surprise, as I thought we’d have to cab it back to the hotel since it was so long after park closing). The bus we got on broke down a few minutes into our journey—first time we’ve had that happen at Disney—but a backup bus showed up before too long and we made our way back to the Poly. Jealous! We go to Disney about every year but I want to go at Christmas time so bad.